Headphone Amp with Integrated; Connect on Tape Out? I have a Squeezebox Touch into a DAC over coax, and out the integrated over RCA. I'm looking for the best way to get a headphone amp connected to the integrated to share the source/DAC. On the integrated, I've got one set of preouts and also Tape Rec/Out. Can I use the Tape Rec/Out with Tape Mon engaged for the headphone amp? My understanding is that the volume control on the integrated has no bearing on the Tape Out volume, which is what I prefer since I'll be using the volume control on the headphone amp. I'd like to reserve the system's preouts, as I'm considering trying a sub with the unit. Is there a best/better way? Yes, that will (i.e., it should) work. You'll have a 'straight' line-level output -- none of the preamp circuity (volume, balance, tone controls) will be operating on the signal from TAPE or REC OUT. It's essentially a pass-through from the inputs, except the PHONO preamp (if so equipped) will be active on the signal passed to the TAPE OUT. On an amplifier like the 1970s/80s Yamaha integrateds (and some others, over the years), there are separate selectors for TAPE OUT and for the main preamp input selector -- i.e., you could listen to one source via the integrated amp's speaker level output and send another source to the TAPE OUT and thence to a tape recorder or... whatever. Depending on the integrated amp, this could even be a benefit Some of 'em have had sort of iffy preamp sections (I'm thinking of some vintage h/k products, and also the slightly infamous preamp of the Dynaco SCA-35). I have even encountered occasional amplifiers (actually, usually preamps) that would pass a signal to TAPE OUT even when they weren't powered up! Odd but true. Care to share which integrated amp you're asking about? If not -- that's cool, too. Yeah, it'll be with the MF A5. Hmm, well it does also have a built in phono preamp. Wouldn't that only be active if the Phono input is selected? I have the DAC connected to the CD input at the moment. Wouldn't the Phono preamp section still be off (presuming it is under normal operation) if I'm still on the CD input? I always get mixed up with that Tape Rec/Play business on the rear jacks. This go round, it helped to consider that Tape is just plain Tape IN. Lemme digest the doc at the link you provided (i.e., RTFM), before I give you truly crummy advice! Analog output of your DAC to one of the line-level inputs on your integrated. Let's say it's connected to the "SACD" inputs (doesn't matter of course). 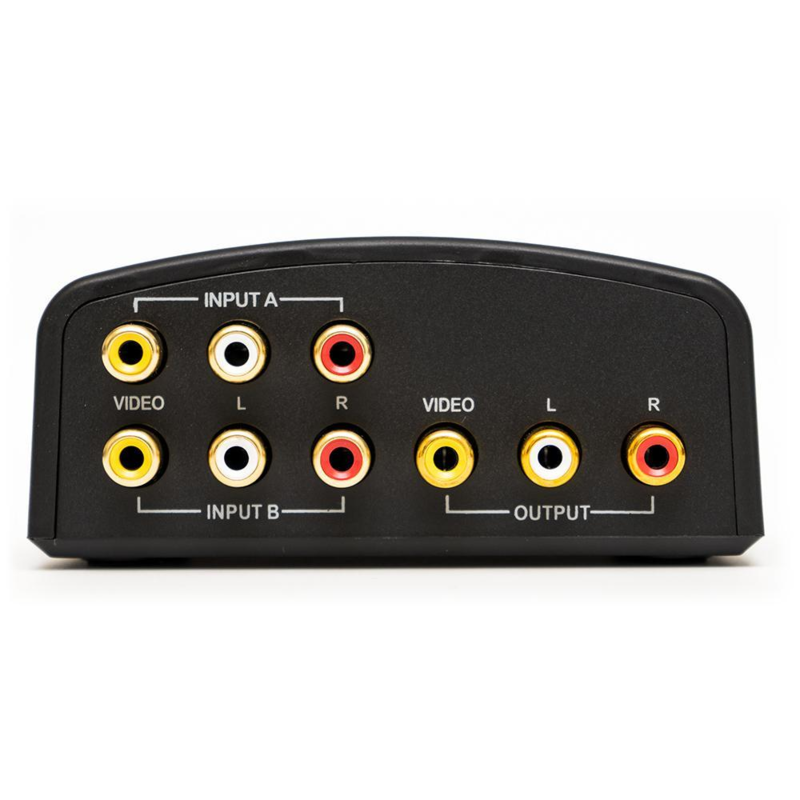 Hook the analog inputs of your headphone amp to the TAPE OUT jacks on the back of the integrated. 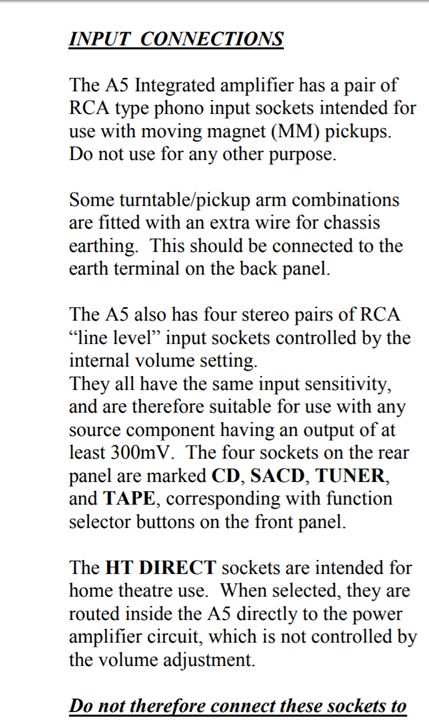 If you turn on the amp, set the input source to SACD, turn on your headphone amp and hook some headphones to it, the "SACD" ouput will be routed "automatically" to the TAPE OUT and thence to your headphone amp and its output as a "line level" otherwise un-mucked with, signal. Adjust volume to taste via the headphone amp. In fact, you can listen to any source connected to the amp this way, if'n you wish. Should work a treat (as they say). You can just turn the volume all of the way down on the integrated amp while you do listen to the headphones. It doesn't look like you can turn the speaker outputs off with this amplifier, and you also can't, unfortunately, turn off the power amp, but it will basically be idling while you groove to your headphones. It should be happy enough. I am assuming it's a normal Class AB output. If the power amplifier is Class A, of course, it will - unfortunately - be running full tilt no matter what the volume setting is, or whether or not there is any signal being input to it. Thanks Doc. Okay, so it sounds like the integrated is always sending the selected input's signal to the TapeRec jacks. 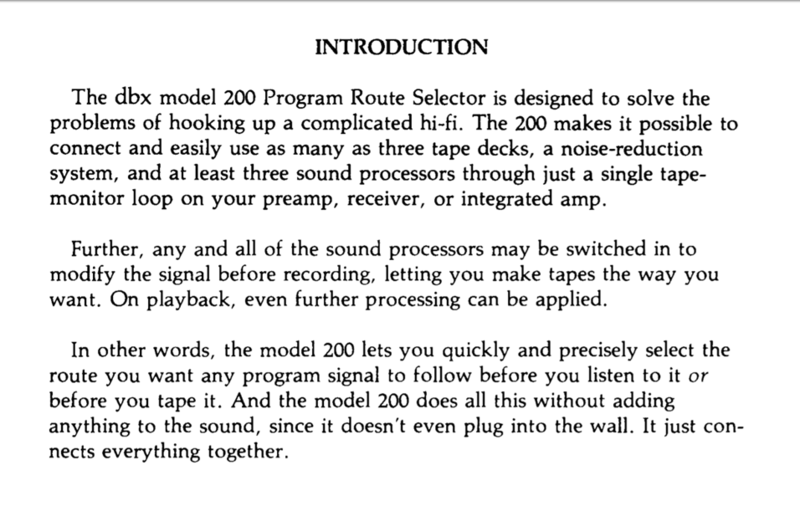 Doesn't really seem to say in the manual what actually happens when Tape Monitor is engaged. I know the speakers go silent, but is it cutting the speaker relays or something else? Seems to be one of those questions that's difficult to pose to the Googling machine. Tape Monitor aside, of interesting note on the A5, maximum minimum volume (ha) does not completely silence the speakers. If it's really, really quiet, like Elmer Fuddruckers quiet, one can hear the little music playing through. Schiit wrote back and told me that one can use their SYS in reverse with the volume maxed out, essentially making it an output selector switch instead of an input selector. I suppose that would make sense since it's a completely passive device? Gonna read up on this a little more over at Head-Fi. There seemed to be some debate on its use in this manner. 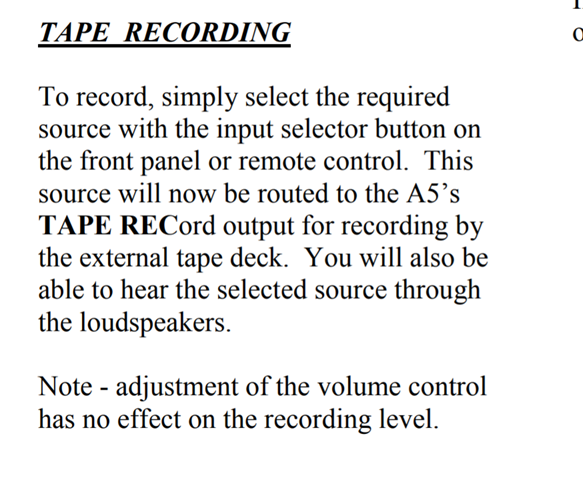 The tape monitor is, in essence, a loop -- well, it's an open circuit until and unless the loop is closed by connecting it to a tape recorder. No, it doesn't cut the power amp; it just sends the input from the tape recorder (i.e., whatever's connected to the TAPE IN sockets to the preamp (and thence to the power amp). If you hooked up an old school tape deck to the two pairs of TAPE jacks, you could record any source selected from the front panel via the TAPE RECord outputs. You could listen to the tape deck's playback by pressing the TAPE MON switch. The reason it's set up that way is that, if you hook a three-head tape deck (i.e., one with separate play and record tape heads) up to the two pairs of TAPE jacks on your amp, you could actually listen to the real time signal being recorded on the tape via the deck's playback head. 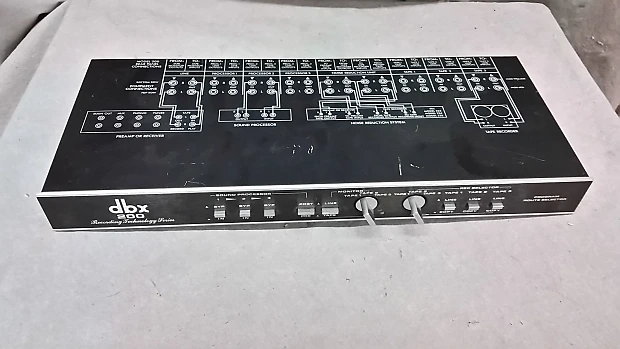 Three head decks usually have a SOURCE/TAPE selector switch on the front panel, so that either the input or the output signal can be monitored (via the TAPE MONitor). 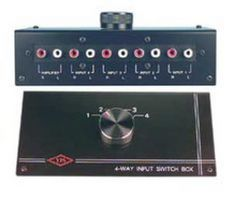 The TAPE REC jacks, though, shouldn't be overridden by pressing the MONitor That's why the MONitor selector is usually separate from the source selector switch on old-school integrated amps or receivers. In your present case, you hear nothing when you push the MONitor switch 'cause there's nothing hooked to its input. you could always get one of these and go crazy routing signals all over the place. I'm not bein' totally facetious; I have one of these They're cheap on eBAY. You couldn't come close to building one for what they go for used -- I think the one I have was $20, and shipping was cheap because they're fairly small and light. This is gonna take some time to digest. I kept seeing this 3-headed business in some reading, but didn't really know how it mattered. Ohhh, jeez, I was completely missing a bit on the Tape Monitor portion. It'll have nothing to do with the headphone amp I'll have connected to the TapeRec jacks. I really wasn't thinking far enough about what it's actually used for. I think I was just wondering whether it would be best to engage TapeMon to shut down whatever portion of the integrated would be unnecessary when I'm using the headphone amp. But yes, I can see here where a speaker selector switch would be handy, in the ability to simply turn off the speaker outputs. 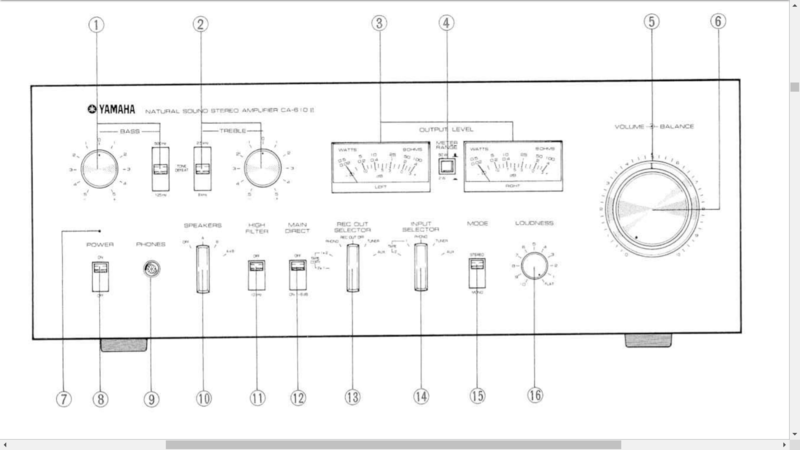 I imagine it's not an option in this unit because one, there are only terminals for one set of speakers, and two, no additional switches/buttons to keep the signal path clean? Why's a passive switch make you shudder?!? What happened to the flippin' edit button? I know, I made fun of you in the other thread and now I can't go back and change it! Nothing per se: I use one -- actually (heh-heh-heh), two, kinda partially daisy-chained. It's just running the signal "backwards" through a resistive attenuator. My higher brain centers have no credible argument about it, but my reptilian brain and limbic system get all jittery about it. It's not a rational thing. I need to read up more on this, but I'm thinking maybe the mod they were discussion in Head-Fi was disabling the "resistive attenuator" - is this the same as the volume potentiometer? yes. The volume control (attenuator) in the Sys is almost certainly a simple variable resistor ('pot' = potentiometer). 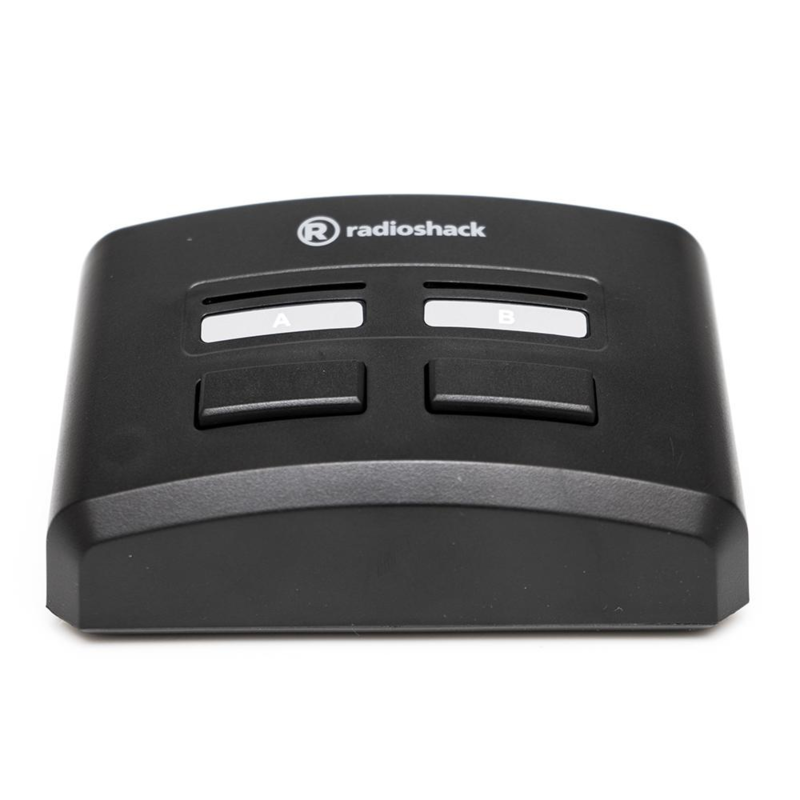 If you bypass/disable the volume control, though, you might (IMO) just as well buy a little switch box like they used to sell at Radio Shack (back when there were Radio Shacks out in the strip malls and byways of America). Heh, heck -- they still do. I need to see some of these things and to test them with non-mission critical gear to see if I blow anything up using them in reverse. Or, find one that's single input, selectable out. The switchboxes sans attenuators are totally 'reversible'. I'll see if I have any spares gathering dust (I might).